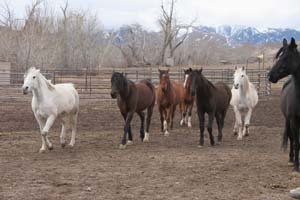 You'd think she was a celebrity, the way the herd came running to meet her. 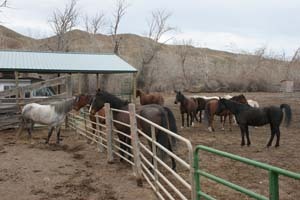 I put the new Gray Mare in the small pen where she could meet everybody over the fence. 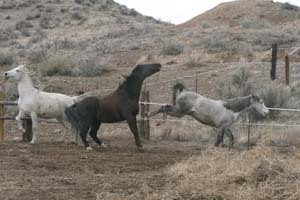 They walked, trotted, galloped up to see her; shoved each other around, squealed, tried to bend the fence rails to greet her. 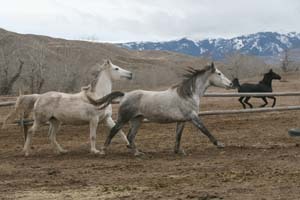 After that novelty wore off, I moved her to the big hay pen with the other mare Sunny - near the bottom of the totem pole, and the old gelding Krusty - who has worked his way back up near the top of the totem pole. 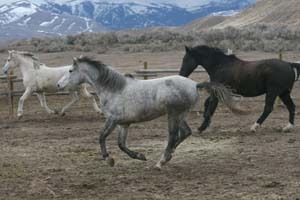 They didn't treat the Gray Mare much like a celebrity. 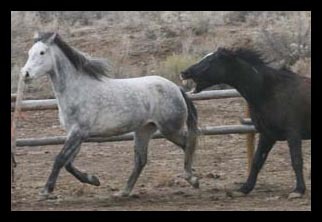 Several times, Krusty went after the her with his teeth bared. 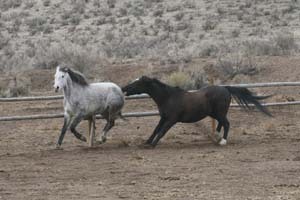 She double barrelled back at him, not really fleeing in fear but just getting out of his way, and giving him What For. 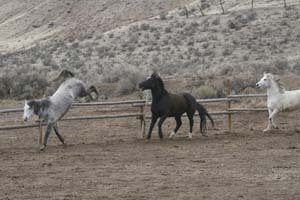 Her hooves connected with him a few times. 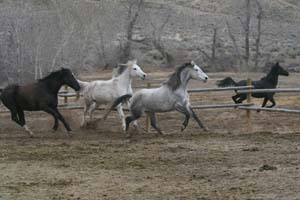 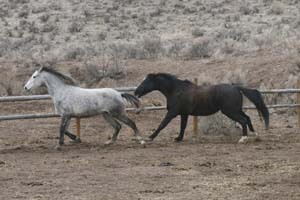 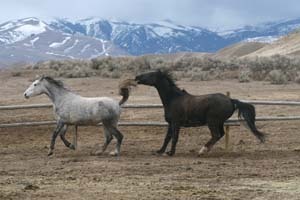 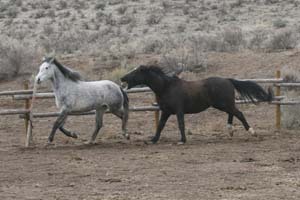 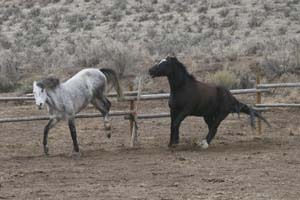 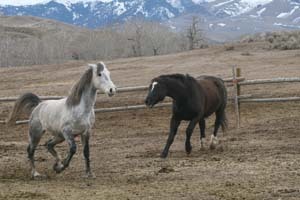 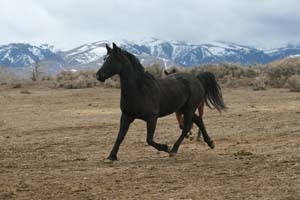 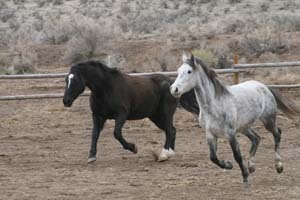 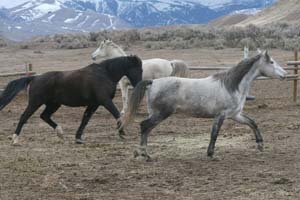 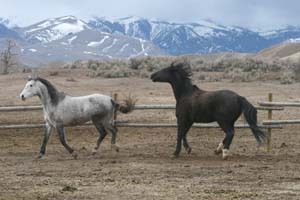 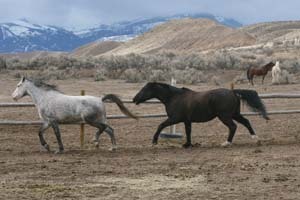 Then Krusty got very protective of Sunny - whom he normally doesn't pay much attention to - and he kept the Gray Mare away from her, herding Sunny this way and turning the Gray Mare that way, working hard at being a big barrier between the two. 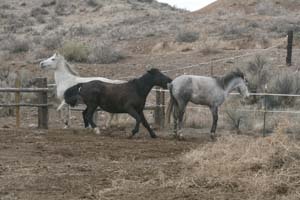 and the four of them ran back and forth along the fence. 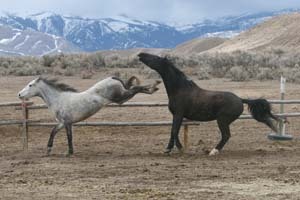 After that novelty wore off... 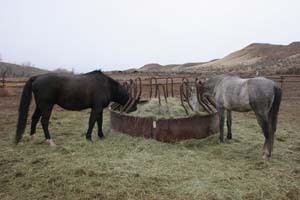 I turned Sunny out of the hay pen with the rest of the herd, which left Krusty and the Gray Mare... and Krusty had nothing much to do but eat hay with his new friend the Gray Mare.